Beyond Sound: Shepherd Centre graduates shine! Last month The Shepherd Centre held its first Beyond Sound conference and feedback has been wonderful! 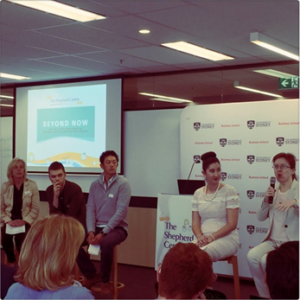 The inaugural event brought together Shepherd Centre graduates, parents and professionals from the technology, employment and not-for-profit sectors. A significant highlight of the day was the opportunity to connect, network and share experiences. The presentations and guest speakers were another highpoint, with topics covering employment, advances in hearing technology and the impact of mentorship and advocacy. Cochlear Limited’s Chief Software Architect, Victor Rodrigues spoke about the future of hearing technology, including big data, artificial intelligence, social media revolution, telemedicine, virtual reality, Cochlear’s work in this space and future developments. Beaumont People’s Managing Director, Nina Mapson-Bone shared her tips on how to best combine job seeking, employment and the four ‘D’ words: disclosure, disability, deafness and diversity. Past Shepherd Centre graduate, David Romanowski talked about his incredible experiences working with Hear for You, a mentoring program for deaf and hearing-impaired teenagers. The Alumni Allstars panel provided valuable insights into the importance of advocacy and the need to support hearing speaking deaf people throughout their education journey. Families said the conference was “fabulous” and “fantastic”. As a family centred service, The Shepherd Centre supports graduates and their families beyond early intervention as they progress through primary, secondary and tertiary education. Our Alumni Club ‘Beyond Sound’ provides members with exclusive Shepherd Centre Alumni events, personal development opportunities and ongoing involvement in The Shepherd Centre’s activities. Next year’s Beyond Sound conference will be packed with more amazing presenters and graduates sharing their expertise on living, learning and working with hearing loss.